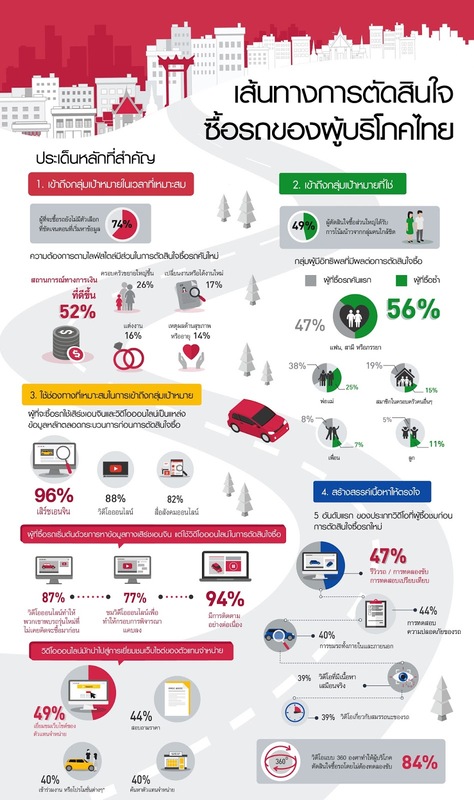 Research into Thai Auto shopping habits shows over 8 out of 10 (84%) of Thais would be prepared to buy a car without a test drive after watching a 360 video. At the “Think Auto” event held in Bangkok, Google shared new research into Thailand’s auto industry and how consumers find and buy cars in today’s fractured media landscape. New “Drive to Decide” research from Google and TNS outlines the complex journeys that consumers make before making their final purchase. The survey comprised 518 interviews with new car buyers, men and women who are online and bought a car in the past 12 months. Thai consumers are better informed than ever before. With a whole host of ways of finding out about products and services, consumers come to the dealership with definite views on which car they want. It’s a long and winding road to deciding a new car. Most Thais take around two months to choose a new car. Thai consumers are open to ideas while researching. On average, Thais consider 2.4 brands before making a choice, but 74% start the process without a clear choice in mind. This is good news for marketers looking to influence consumers. Search is the most influential. 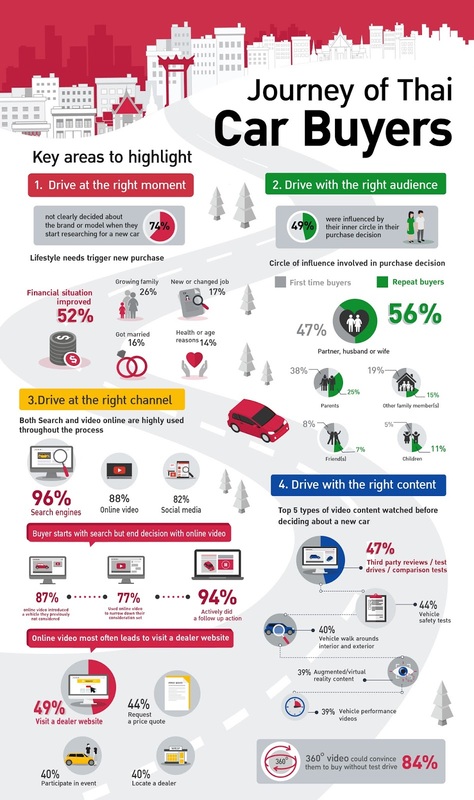 Over 9 out 10 (96%) of auto shoppers find Search the most influential source of information at all research stages. Video also plays a role in brand choice. Almost 9 out of 10 (88%) said they used online video in the buying process and 87% said that online video introduced a new vehicle they were not previously considering, and almost half (49%) said that they went on from watching videos about cars to visiting dealers. And 360 video could replace a test drive. A surprising 8 out of 10 (84%) said that 360 video could convince them to buy without test drive. The research shows that marketers must be present from the start of the consumer journey in all the moments that are shaping consumer decisions. Brands that go the extra mile to not only show up but offer helpful, relevant content from the first moment a consumer turns to their phone are putting themselves in pole position. Saruth Ingkavat, Marketing Director, Ford Thailand commented, “We differentiate ourselves in this highly competitive industry with a “Digital First” strategy to reach consumers through digital channels. Our campaigns are built on a strong foundation of analytics to ensure that consumers are not only aware of Ford but also engaged. Working with YouTube has played a tremendous part in growing our brand and business. We were not only able to overcome a challenging year in vehicle sales but also outperformed and thrived when comparing to other major players. Google telah mengungkapkan penelitian baru pada industri otomotif Thailand. Dan perilaku memilih untuk membeli mobil di era saat ini di mana media telah menyajikan berbagai informasi sebelum membuat keputusan.